*This post originally appeared on The PediaBlog on January 11, 2016. Sesame Street got so many things right with its new character, Julia, an orange-haired girl with autism whose eyes never quite meet the reader’s. 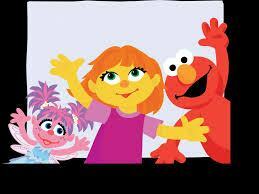 Introduced in a digital storybook available online and in print, Julia is described as an old friend of Elmo’s. When Elmo’s muppet friend Abby meets Julia, she is confused, and she has questions. Julia doesn’t talk to her right away, does that mean Julia doesn’t like her? Why does Julia get so upset over loud noises? And then there are the things Abby doesn’t comment on — Julia knows every word to a lot of songs. She spins the wheels of toy cars over and over and over again, and flaps her arms when she is excited. She is a recognizably different (and recognizably autistic) without being overwhelmingly so, and while not every child with autism is exactly like Julia and she doesn’t (couldn’t) display every possible characteristic of every child with autism, children with autism can find themselves in her, and children learning about the condition can start here. Watch some really good videos and meet Julia and other amazing people and characters on Sesame Street here!